If ever one was in Palm Beach from the 1950's on, the person with the best "Ways With Food" was none other than Harriet Healy. 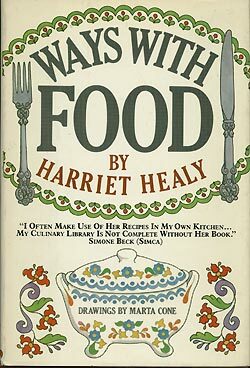 Healy taught the rich and famous a thing or two about food. Her reputation as a cook with a flair for entertaining grew. She was an American hostess who imparted a casual hand to entertaining that motivated generations of women. Healy was the "go to" for fashionable feasts in Palm Beach. Trained at the Cordon Bleu, her reputation grew out a series of cooking classes she offered at Au Bon Gout, her gourmet food and accessory shop. Though Healy is a name that may not be familiar today, she was regularly mentioned with such culinary giants as Craig Claiborne, Pierre Franey, Julia Child, and James Beard. According to Craig Claiborne her kitchen was one of the most stylish and well equipped in Palm Beach. For more info on that kitchen check out this post from The Peak of Chic. Healy published sever spiral bound cookbooks based on her classes at Au Bon Gout and in the early 1060's she edited the Palm Beach Garden Cookbook, a collection of recipes from the Palm Beach Garden Club. In 1982 she published Ways With Food. The cookbook is a product of its time. There is much Campbell's soup and lots of mayonnaise. In fact, Healy advises that a cook not bother to use homemade stock when using curry powder. Here is her recipe for a cold lemon soup. It is like a Greek soup, she says but with no cooking! Strain soup, add the cream, chicken stock, finely chopped mint leaves and lemon juice. Soup must be served ice-cold. If you do not have chicken stock, the soup is still good thinned with cream and milk. The soup must not be too thick. Soup cups may be decorated with parsley -- this is more effective on glass cups. I was very interested in recipe for Souffle Crackers, a recipe that called for soaking Uneeda Crackers in water for 8 minutes, then broiling them till brown. Alas, Uneeda Crackers no longer exist! While the recipes might seem a bit dated, one thin that is not is Healy's taste in kitchen ware. Au Bon Gout was the place to buy Dodie Thayer china with its unmistakable leafy patterns. IT was a popular purchase for everyone from Jackie Kennedy to C.Z. Guest. 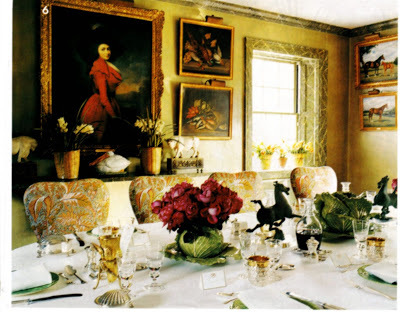 The late Brooke Astor had a collection of 218 pieces including a tureen, cover and stand, a large salad bowl, a circular serving dish, a circular platter, four oval platters in three sizes, a trefoil condiment dish, forty-one dinner plates, thirty dessert plates, fourteen side plates, thirteen salad plates, eight shallow circular bowls, eight small bowls, a coffee pot and cover, a milk jug, a cream jug, nineteen coffee cups and saucers, four tall vases, six small bud vases, eight candlesticks, four salts and six small ladles, six pepper shakers and fifteen butter pads, impressed marks. Estimated to sell between $ 9,000 and $15,000, the lot sold for a whopping $74,500.